The Night Gardener may be pegged as middle grade, but it certainly scared me as a reader at times. The story is of two Irish siblings, Molly and Kip, whose parents were lost at sea and they are on their way to find work in England. At least they would be, if anyone would tell them where to find the house in the woods, one that no one dares to near. On the way they meet an old woman, who tells them the way in exchange for a story, she is curious as to what happens at the house they are on their way to. Molly is a story teller herself and you can tell from the beginning that there is a secret that she is keeping from her younger brother, who limps and has to use a crutch to get around. She pretends as though her parents are on the way to them, but it seems there is more that she knows about what happened before the orphanage and leaving for this job that she wants to reveal. Upon reaching the home, there is an eerie air to it, but a darling little girl named Penny opens the door and starts to rifle through Molly’s things, breaking the mood in only a way a silly little girl could. The mistress of the house is one not to be trifled with and she reluctantly takes on Molly and her brother, but says that Kip must sleep outside, so not to infect the rest of the family with his crippled state. She seems cruel, but is keeping her own secret. Penny has a cruel older brother Alistair, who loves sweets and bullying anything smaller than himself. Kip interferes on a couple of occasions, when he takes to bullying his younger sister. The rest of the mystery comes from the strange tree that is a part of the house itself and a room that is not supposed to be entered. Curiosity brings Molly to find out what is behind the door, seeing the different family members go through and come out with something of value to themselves, bags of money, sweets, books about Penny’s adventures, and a ring for the mistress. Mixed in with this is the terrifying nightmares that come while sleeping in the house, and one night Molly awakes to a wild wind throwing leaves throughout and revealing a frightening man who seems to be taking care of the large tree with a watering can. What all this has to do with the family becoming paler and sicker, Molly is not sure. 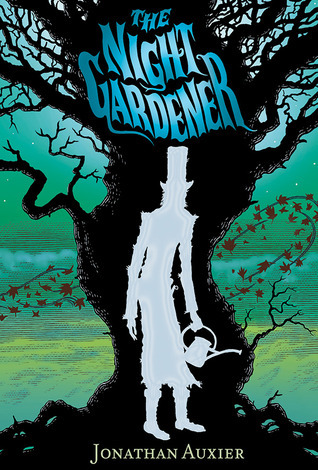 I absolutely loved The Night Gardener, the suspense, the horror and the unique characters that Auxier wraps into the book. Molly is a great character, with her own strength and courage who feels the need to figure out the mystery, while keeping her brother safe. All the elements fell into place and made for a fantastic read that will keep you up all night. This one sounds intriguing. Need to check the sample on Amazon. Cover art is amazing. Reminds me of Halloween. The synopsis sounds interesting. Working at a rundown manor seems creepy enough, but to be confronted and then find a curse threatening their lives. Such brave kids because I’d probably run quick! Lol. Your middle grade book reviews definitely are making me more open to them. doing the COver Scavenger Hunt and having fun! I agree with the others the cover art really is pretty. I love the colors used. OMG this sounds amazing. and the cover looks great too. I’m glad you enjoyed it. I haven’t heard of it before! Thanks for the challenge!!! I like how bright the colors are in the cover but that it’s dark at the same time. I really enjoy books that are a bit scary but I’m also a chicken for certain things, haha. It sounds like a good book. OMG! I love this cover and the plot sounds amazing! I want it NOW!!!! I’ve never heard of this one before but it sounds very interesting. I will add it on Goodreads. The cover is beautiful. Very nice review! I wish more MG books had suspense and horror in them. I like spooky books and this would will really be apart of my TBR list. This reminds me of Neil Gaimen’s books that are meant for MG but are still enjoyed by older folk. I think I might try it more nearer to Halloween. Again, the cover tells you everything about this book! And it sounds like it didn’t disappoint! I haven’t got to this one yet but I absolutely loved his first book. Glad to see the great review!